I’ve been poking around these tabletop RPGs, but what about other kinds of games? Which are the best Post-Apocalyptic Video Games? Let’s begin with those VideoGame Geek users rate as their top ten. (I’m skipping a couple that seem mislabeled like Borderlands. Fallout: They rate Fallout 2 highest, which suggests something about the old-school nature of the site. Then Fallout, Fallout 3, and Fallout: NV. You'll see this property pops up on the tabletop list below. The Last Of Us: That seems a decent call. It’s a shroom zombie apocalypse, but with a human story. Bastion: An interesting game and one I hadn’t placed in this genre before. Gears of War: "World destroyed by alien invasion" genre. They list GoW 2 as the best. Neuroshima Hex: The app of this BG based on the German PA universe. Wasteland: An oldie I never played. I remember it from the game store’s PC software rental case. The new one’s supposed to be excellent. S.T.A.L.K.E.R. : A game I mentioned on the last list in conjunction with the tabletop game with the same name and different premise. Shin Megami Tensei: Nocturne: One of the best games ever. I’m replaying it right now. World gets blown up by demons and you have to figure out how to literally rebuild it with philosophy. Darksiders: Religious apocalypse and you get to play a Horseman. Yippie? Enslaved: Dystopian system-crashed future loosely based on the Chinese classic Journey to the West. Seriously. A Forbes article has many of these, but switches some out, replacing them with Tokyo Jungle (cool), Metro 2033, Telltale’s The Walking Dead, and Half-Life 2. For #1 they pick the hellish wasteland of juvenile mutant fighting: Pokemon. Games mentioned on other lists around the net: Fahrenheit, Left 4 Dead, Beneath a Steel Sky, Final Fantasy VI, Fuel, and Day Z. As an interesting coda, Kotaku has an article about Submerged, a post-apocalyptic video game without violence. That's an intriguing concept and one I think tabletop rpgs handle more easily right now. I like that we're getting some alternate approaches and choices within these games. To keep this list easy to read I’ve tightened the years covered. As we get closer to the present the lists expand and contract weirdly. I include mostly core books, but also significant setting material or sourcebooks. I consolidate “spin-off” and miscellaneous supplements into a single entry. For example at the end you'll see round-up entries with post-apocalyptic elements. Given the number of great things published I haven't included everything I want. I try to list revised editions which significantly change a line or present a milestone. Generally I only include published material- print or electronic. I skip freebie or self-published games. I'm sure I've left something off without adequate reason; feel free to add a comment about a line I missed (if published in 2009). I've arranged these by year and then alphabetically within that year. Originally I assumed this had a simple set-up: fuel runs out, civilization collapses. But Afterpeak's more involved. Exhaustion happens, followed by global brushfire war. But then an alien space zoo crashes, flooding the world with strange animals and diseases. Several years later a weird energy field sweeps across, returning magic to humanity. The material's generally systemless, but there's still some crunch in the equipment lists, bestiary, and discussion of character archetypes. 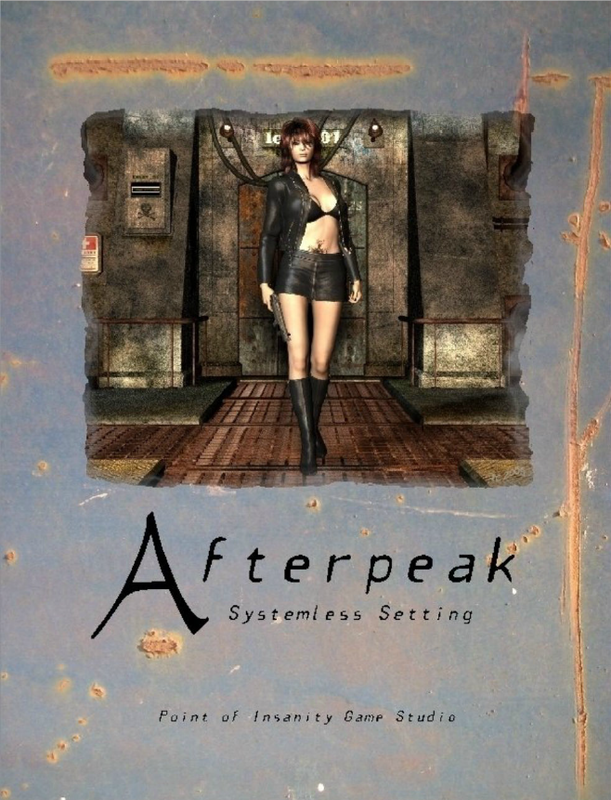 Afterpeak's definitely a kitchen-sink setting. It has interesting ideas, but GMs will have to spend serious time hunting through and extricating them. This is the first of three products with controversial publication histories on this list. You can apparently still get the '09 version. But there's also a more recent one clocking in at twice as long. The sale page notes for that expanded version notes, "This is the only official version of the Afterpeak Systemless Setting. 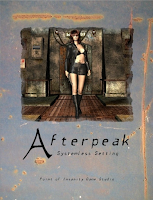 Any other version of Afterpeak or products written for Afterpeak you might find being sold through any company other than Point of Insanity Game Studio is being done without the author's approval or involvement. I cannot guarantee the quality or content of these products." I assume there's a dispute over the earlier version and rights. That earlier edition comes from the ironically named FreeFall Studios, purveyors of copious quantities of CG boobies. Looking at the cover, I assumed Atomic Highway would be something like octaNe or a rough and gritty Mad Max-ian slice of the nasty. Instead it opens with a clean discussion of role-playing and a two page comic showing how a session works. It's designed to be accessible and open to new players. Atomic Highway opens with a tight explanation of the present state of the world, skipping the extensive history that so many other games drown in. It aims to offer a sense what kinds of communities the players have come from and as importantly the social relations and structures operating there. Character creation's fairly simple- attributes with a 1-5 value combined with a tight skill list. I like that an explanation of "ground rules for playing" prefaces this section. While some games have a "What is an RPG" section, fewer have a discussion of generous and safe play early on. Players may choose to be mutants, gaining a simple benefit and flaw. Again Atomic Highway offers a short list rather than overdoing it. The densest mechanical section covers vehicles and customization, but even that's fairly easy. As someone who doesn't usually like heavy "build-a-bot" mechanics, I actually like this. Overall Atomic Highway's decent. It has random scavenging tables worth lifting for other games, simple mechanics for chases, and about a third of the book has GMing advice, adversaries, and a sample adventure. 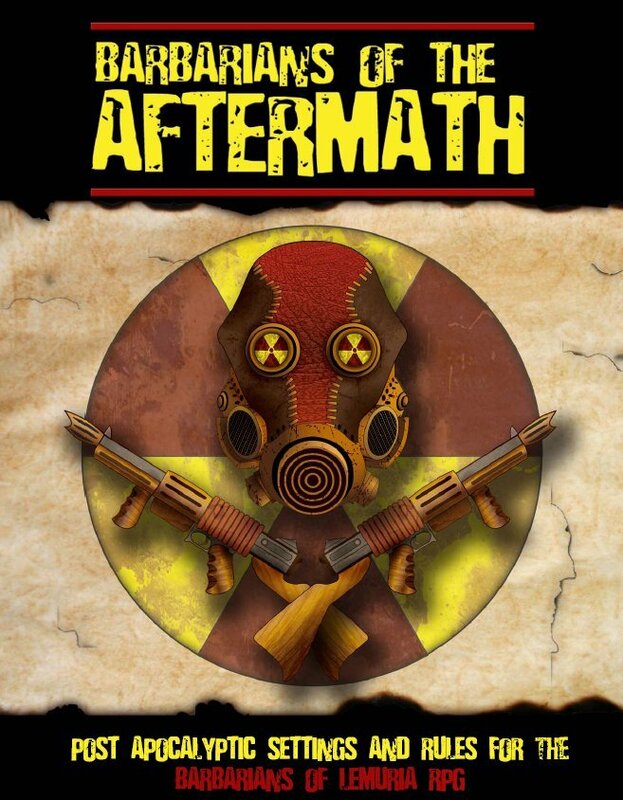 If you're looking for a solid and simple game to do general apocalyptic games, you should check this out. It doesn't hurt that as of this writing you can get the full pdf for free from RPGNow. You can also get the supplement, Irradiated Freaks, for nothing. This builds on the light Barbarians of Lemuria system. Barbarians of the Aftermath expands those mechanics with a solid toolbox for running post-apocalyptic adventures. Rather than provide a set background, it has many options focused on survival against the odds in a fallen world. Groups can generate the history and setting using a series of random tables. Earlier results modify later ones tie things together thematically. All kinds of apocalypses are on offer here. While it's wide ranging, I wanted even more depth to the initial tables. You don't get as much color or variation as I wanted. The rules themselves offer a host of character genotypes and careers- with the idea that the selection can be tuned to the world created. There's a good section on the obvious crunchy bits for this kind of game: mutations, psychic abilities, weapons, vehicles, chases, typical adversaries. The book ends with a short adventure generator and some designer notes. The package isn't bad but I ended up wanting more. I expected more random tables and interesting generation options. As a supplement for BoL it works and works well. As a general toolbox, it's a little less successful. It doesn't go far enough or in enough detail. Barbarians of Lemuria has been revised thanks to a recent Kickstarter. Perhaps this will be expanded as well. Late 1945, with the German war machine hemmed in on all sides, the Nazis activate a desperate sorcerous plan. They invoke Ragnarok and call forth the Midgard Serpent, Jörmungandr. With a head 350 miles across, the beast smashes armies, cities, land-masses, rising up from the depths and creating a massive, writhing doom. Fleets are swallowed and dripping venom poisons the air. Truman takes desperate action, launching a B-29 from Iceland armed with the single Trinity device. It flies into the mouth of the serpent and explodes. The death-throes of the beast spill radioactive venom and blood high into the atmosphere- a hideous brew of atomic death and supernatural mutability. That spray carries far, engendering horrors and poisoning the land everywhere it falls. But even worse is the massive crash as a the corpse plummets into the Atlantic Ocean and elsewhere. Earthquakes and a mile-high tidal wave destroy the East Coast of the US and befoul everywhere it touches. Central Europe, England, Egypt-- a host of countries are simply crushed under the weight of this thing. The darkness creates a year of winter. You end up with a pretty horrific post-apocalypse setting-- albeit one in an unusual time and with a supernatural source. Hite hints at more to come (Fenrir's arrival and the death of Tyr) but for the most part we're in a poisoned world trying to survive. That survival must come in the face of Commie Agents, Tainted Lands, Shambling Monsters, Political Manipulators, and Crazed Cultists. The weird tech of the setting comes from researchers developing new sciences and devices from the very body of the serpent itself (armor from its skin, eye drops from the sera of its blood, rocket packs fueled by Midgard Oil, and so on). Think steampunk or The Rocketeer by way of Cthulhu. I enjoyed reading The Day After Ragnarok-- it has a good deal of historical in-jokes and references. At heart it's a setting for cinematic and furious action. I can certainly see running this as a short-campaign to shake things up. The material's presented cleanly, with a mixed bag of illustrations. If you like Alt History, Pulp, or even Occult Games then I'd suggest picking it up. Atomic Overmind has supported it with a few pdf supplements, but that seems to have dropped off. Originally released for HERO and Savage worlds, they've recently released a FATE edition as well. 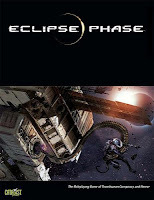 Eclipse Phase describes itself as a "...game of post-apocalyptic transhuman conspiracy and horror." In the future, the human race has lost the Earth. Technology advanced at an ever increasing rate, causing transformations throughout society. Commercialized space travel, uplifting, augmented reality, hypercorps, genetic enhancements, and militarized AI each created new problems and realities. Then potent AIs, known as TITANS, broke free of their control. They engaged in a massive netwar which spilled out as they unleashed real world devastation through weapons of mass destruction. They forcibly uploaded millions of human minds. Then they vanished out from the solar system, taking the uploads with them. Behind they left a wrecked and devastated Earth. Now, perhaps a decade later humanity has fearfully begun to spread out through wormhole gates into the greater universe. Some fragmentary structures remain- through a patchwork of authorities and links, strongly corporate. Most people, including the PCs, are disassociated intelligences, sleeved into bodies based on need and wealth. It may seem like a kind of immortality, but there are costs and dangers. Threats exist everywhere from viruses, to fanatics, to monstrous AIs stalking the stars. 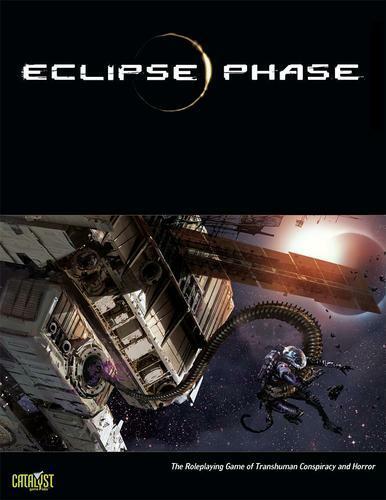 Eclipse Phase does a great job of setting up what the players could be doing- serving with a group called Firewall fighting threats to the humanity's existence. But everything I've read and heard suggests that the game set up, despite being detailed and dense, is also open. You can run many different kinds of campaigns, genres, and styles within the framework. The system provides you with high crunch tools to carry that out. Normally I'd describe this kind of game as "kitchen-sink" apocalyptic, but it does a great job of compartmentalizing the modules. As one GM told me- you could easily make the game into any style you wanted. The more you know. Today I learned Interplay licensed a relatively small company to do a tabletop rpg for Fallout. Then I learned that shortly afterwards Bethesda bought the property...and promptly sent a cease & desist letter to Glutton Creeper Games. This led to a series of further legal entanglements and decisions, with the bigger companies essentially skipping out on judgments against them. Still GCG did eventually produce a post-apocalyptic game, Exodus, albeit with the 1950's themes stripped out and apparently replaced with a 1970's monster movie vibe. The shift is smart, but steals away some of the charm of the original setting. 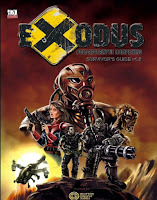 Exodus offers a d20 Modern setting, with a nuclear war in 2012 bringing everything crashing down. The game takes place 30 years later. 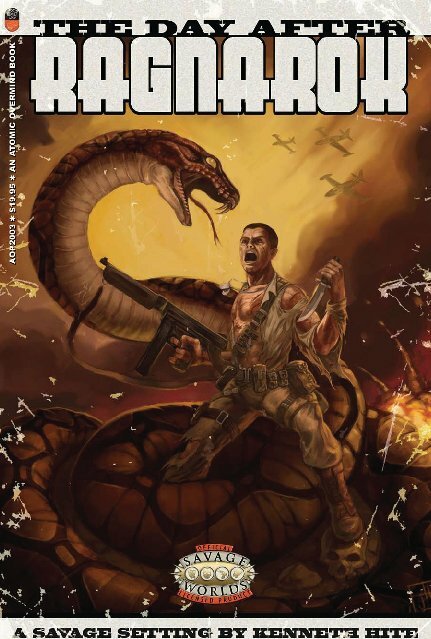 The version I looked at (the 1.5 pdf of the Survivor's Guide) is a mixed bag. Especially the art. It isn't just a supplement book you use with d20 Modern. Instead it’s a complete rule book with all of the mechanics included. That leaves little room for setting and backstory. We get a chunk of that through the mechanics (talents, classes, races), but the "Exodus Primer" is literally six pages towards the end out of a 300+ page book. I hoped there'd be more for folks really wanting to do a Fallout-like game. Still the publisher supported the game with organized play modules, the Wasteland Bestiary, and Southwest Wasteland Guide. 4 Hour Games bought Glutton Creeper in 2014, but they're still listed as the publisher on RPGNow. A few days ago they posted an "early access" Overseer's Guide ($13 for 40 pages as of this writing). Hopefully that will be expanded. Notably it bills itself on the site as Pathfinder compatible, so perhaps that's what's on offer there. Also: I don't want early access rpgs with slow drips of content to become a thing ("don't worry we'll add more pages...). A 560-page beast of game from German publisher Nackter Stahl. The world is entering a new ice age, but the battle for survival includes cyborgs, mutants, psychics, and beyond. Corporations and nations have prepared for the coming crisis by developing new weapons, including new lifeforms tailored to survive glacial conditions. The whole thing has a cyberpunk vibe. Frost Zone has a few supplements, but doesn't seem to have developed a huge following. 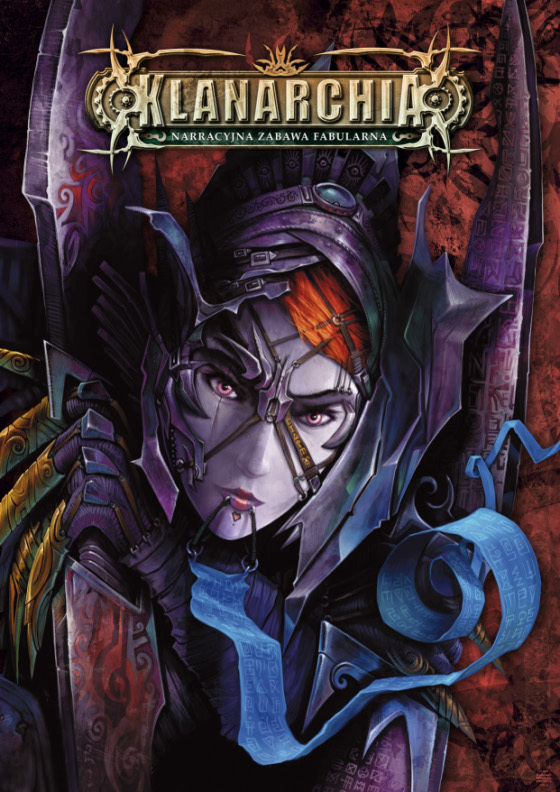 If you know German, the main book as well as a couple of pdf supplements are available on RPGNow. This is an adaptation of Tunnels & Trolls for use as a Gamma World-style game. Unfortunately it is published by James Shipman of Outlaw Press. He's stolen artists' and writers' work as well as illegally published supplements for T&T. There's a long history on this. Here's a quick Google search. I love poking around and reading game blurbs. The description suggested a Final fantasy-like world, where some kind of magical devastation in the past had resulted in a weird technomagic hybrid society. It seemed like a little game that perhaps took itself too seriously. Designer Ben Warren released a new edition in 2014. You can get that for free from RPGNow. 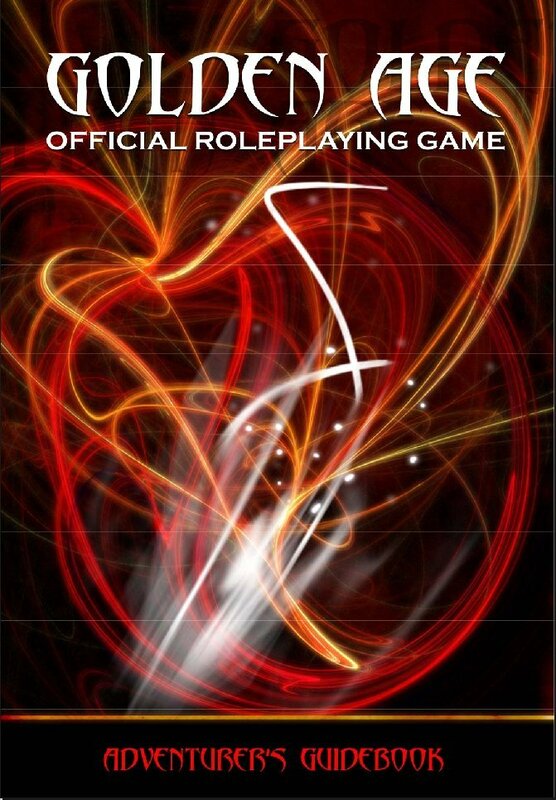 There I noticed that it's called "The Official Roleplaying Game," which seemed kind of pretentious. I mean it wasn't like a licensed property. Wait, maybe it is and maybe it isn't. See Golden Age is based on a series of independently produced British audio plays. So they're a kind of self-published post-apocalyptic fantasy setting with scripts and actors. The creator of that world, Ben Warren, also designed this game. I'm a little surprised that the RPGNow blurbs down say anything about the source material. The game itself is OK. It seems rules light. The layout's not great- OK if dense text design marred by a seriously intrusive page background. The book lists available products that don't seem to actually exist. If you're a fan of the original setting, then this is probably worth grabbing. For post-apocalyptic enthusiasts, not so much. Those apocalyptic elements are in the distant past and seem to only matter lightly to the current setting. Also written on the publisher's website as "Clanarchy." This Polish rpg combines magic and technology. It seems the world has been destroyed by a magical cataclysm. Centuries have passed and new technologies have arisen. Yet still many areas remain blank spots on the map. The game definitely has a heavy horror bent. It reminds me a little of Mutant Chronicles, but with even more fantasy. It looks like they only published a single core volume for the game. However, they're apparently in the process of developing a second edition. One of the selling points of this new version is a reliance on illustrations to get across the atmosphereand setting of the game. The publisher page likens it to a graphic novel, inspiration more than mechanics. They plan to cut the original 400+ page core volume down to a mere 150 pages. You can see a small gallery here. That's an interesting idea and something we haven't seen that much of- if they truly do go with a GN approach. A few games, usually superhero, have done "comic book" pages, usually to only illustrate play examples. RPGObjects retooled d20 Modern to create Modern20 in 2009. That same year they released several short genre sourcebooks (Horror20, Supers20, Martial Arts20). As a result Post-Apocalypse20 primarily offers mechanics: feats, occupations, mutations, etc. There's a short section at the back with a few pages of GM advice on running PA games. This book primarily serves d20 Modern and Modern20 players. No clue. I'd heard the name Strontium Dog tossed around in the context of the 2000AD comic anthology, but I associate things like Rogue Trooper and Robo-Hunter with that. And of course Judge Dredd...which incidentally also gets yet another edition this year, Judge Dredd. This one retools material Mongoose developed for their d20 version into a shiny new Mongoose Traveller version. I've mentioned Dredd before on these lists, so look to my earlier comments on the d20 edition for an assessment. But back to Strontium Dog. After a nuclear war, Mutants begin to appear in vast numbers. Not pretty, X-Men mutants, but nasty Total Recall mutants. They become second class-citizens, driven into desperation and dangerous work. The Strontium Dogs of the title are mutants who act as bounty hunters. While the setting has a strong focus on the Great Britain of a blasted Earth, there's a massive network of colonies, aliens, and a Greater Galactic Federation. Players take the role of antihero mutant freelance lawmen, travelling around and hunting down the worst of the worst. 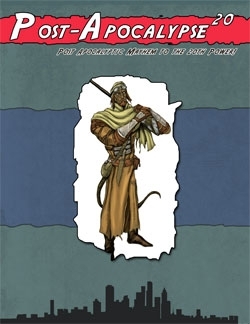 Also based on Mongoose Traveller, this sourcebook contains new mechanics for building mutant characters, specialized equipment, new skills, and so on. About a third of the book covers the background and characters in depth. Strontium Dog has only gotten a single supplement so far, Bounties and Warrants, a 100-page book of missions and plot seeds. A French rpg aka Red Sand. I've read, re-read, and desperately tried to parse the Google translation of this game's descriptions. Here's what I think it is. It takes place on Mars, but in the distant past, before it became the lifeless world we know today. Various races exist on this world which is being swept by climatic shifts. The Big Event(s) happened and now the world's one of ancient ruins and rusted industries. You have robots, magic, alchemical substances, cannibals, psychics, and mutants. There's a focus on visceral survival and violence. 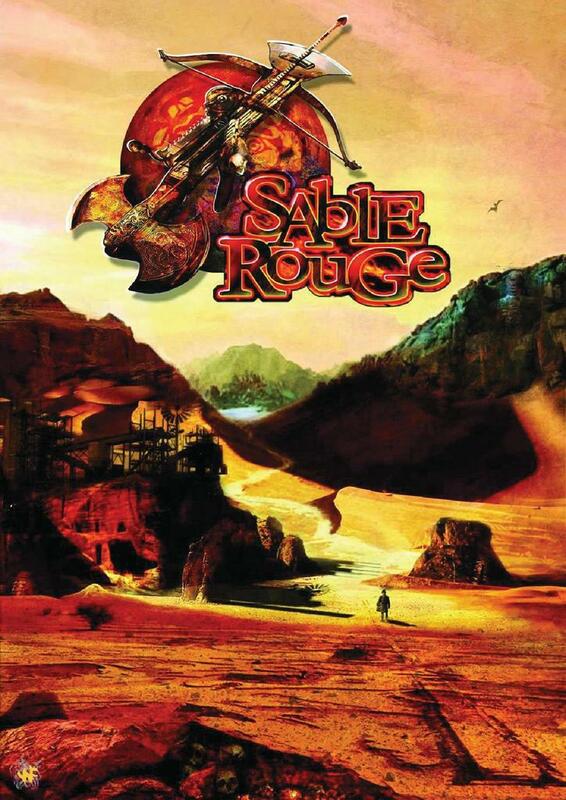 Sable Rouge's Mars seems to be in a trough between Apocalypses, with the final one lying the future. The previous one may have involved an alien invasion. Maybe? The blurb describes it as a cross between "Conan, Mad Max, Pitch Black, Ghosts of Mars, and The Descent." Like so many others, this game doesn't seem to have caught on. 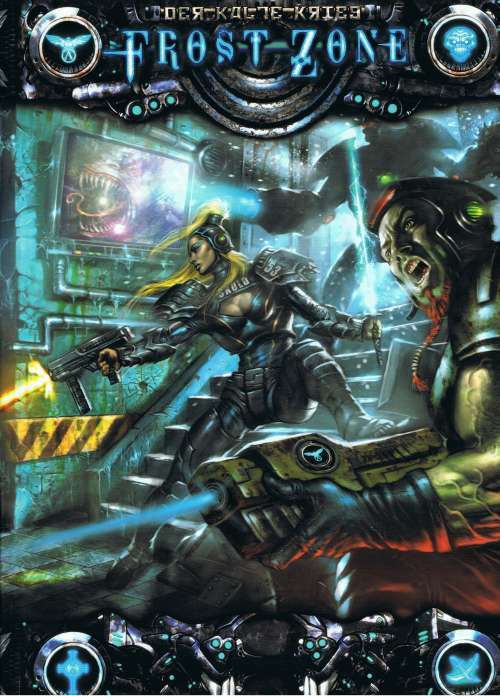 The publisher only released a core book and a GM screen. Zombacalypse very much takes a page from All Flesh Must Be Eaten. It offers a toolkit for running different kinds of zombie survival games based on the Aether RPG. I'm not familiar with that system, but it seems to have moderate crunch. The sourcebook itself covers a general breakdown of zombie concepts, qualities for building different zombies breeds, survival in a zombie setting, equipment, and finally a short set of plot hooks. There's also a sample scenario set in the American Civil War. The whole thing comes in at 100 pages. If you're really enthused about zombie survival and haven't yet sated your appetite, this might be useful to you. On the other hand, I'm uncertain from the blurbs what makes this stand out from the horde. Silver Gryphon games later released a Savage Worlds version, a module called Camp Wicakini, as well as a PWYW scenario, Hotel Babylon. Two existing games get strong support materials this year. Unhallowed Necropolis is a mega-supplement to Unhallowed Metropolis, It has a ton of new options and roles, but also more history and secrets for the setting. In particular it adds to the spiritual and paranormal elements of the world. I'm still not sure if Robotech should be counted as post-apocalyptic. I've seen some tag it that way, but I'm skeptical. In the interest of completeness though, I'll mention Robotech: The Masters Saga. I guess the Masters are some kind of superior Robotech invaders? I'm not sure how they differ from the standard invaders. Four other games feel like corner cases. Shock: Social Science Fiction is an indie game designed to simulate the social questions of more thoughtful science-fiction. While not directly specifically post-apocalyptic, it ties into the heavily social themes of many PA novels. It might be useful for GMs who want to focus on concepts over dirt and crunch. 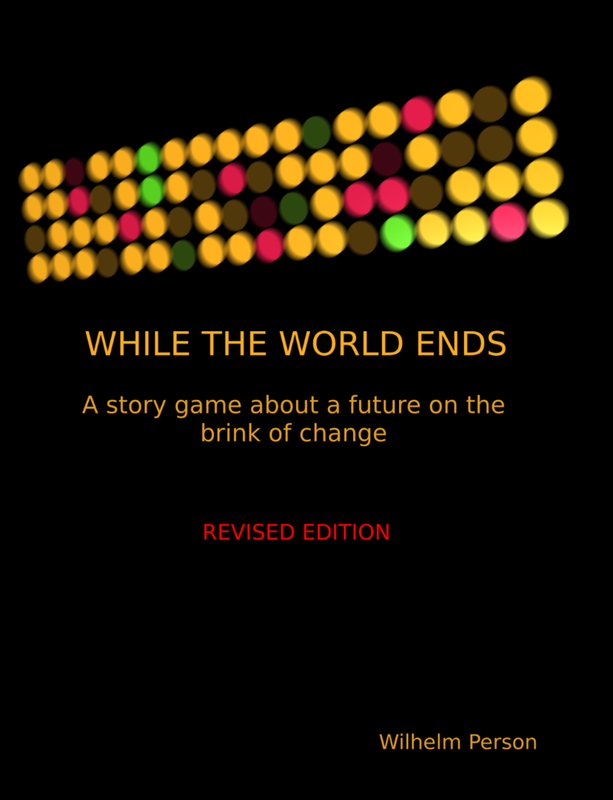 While the World Ends also offers a kind of high-level generic approach. 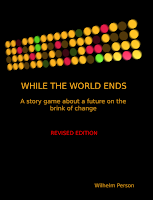 In this GM-less story game, the characters travel across a collaboratively created world on the brink of change or destruction. Players try to play through their PCs goals while shaping the world they move through. When I see John Wick's name on something, I know I have to check it out. He always manages to add something I hadn't considered when I read through his designs- from the bizarre detail of something like Thirty to the excellent advice of Blood & Honor. The Shotgun Diaries is Wick's rules-lite zombie apocalypse game. You get a simple, fast, and frantic game here. When you roll- you're killing zombies. Everything else is unimportant or the path to get to killing those zombies. Players try to accumulate dice to roll. If they fail to get a success, then the Zombie Master gets to say what happens. It is simple and effective. The game is brief but has a number of innovations, including a zombie clock which ticks by building up the next horde to face the group. Finally, Apotheosis Blues is a complete but pdf-only game, so I'd usually leave it off. But it's written by the same person who gave us the free rpg Angel Angels, about an invasion of sperm-collecting extraterrestrials who look like young women and Immaculate, an end-times rpg with holy warriors struggling against Hell. In this game you play a new god affecting a world destroyed by a crisis of faith. "Warning: this game contains religious and sociopolitical themes that may be offensive to some readers. It is intended for mature audiences."